The University of Texas at El Paso (UTEP) is a public research university in El Paso, Texas. It is member of the University of Texas System. UTEP is the second-largest university in the U.S. to have a majority Mexican American student population (about 80%) after the University of Texas Rio Grande Valley and the university's School of Engineering is the nation's top producer of Hispanic engineers with M.S. and Ph.D. degrees. On January 9, 2019, it was announced that UTEP is now classified as an "R1: Research University (Highest research activity)" in the Carnegie Classification of Institutions of Higher Education. This designation is reserved for doctoral universities with the highest levels of research activity. UTEP is home to the Sun Bowl stadium, which hosts the annual college football competition the Sun Bowl every winter. The campus is one of the few places in the world outside of Bhutan or Tibet to have buildings created with the Dzong architectural style. It sits on hillsides overlooking the Rio Grande river, with Ciudad Juárez in view across the Mexico–United States border. On April 16, 1913, SB 183 was signed by the Texas governor allocating funding for a new educational institution which would later become UTEP, making it the second oldest academic institution in the University of Texas system. The school officially opened on September 28, 1914, with 27 students in buildings belonging to the former El Paso Military Institute on a site adjacent to a former Fort Bliss location, at Hart's Mill. The school was founded in 1914 as the State School of Mines and Metallurgy, and a practice mineshaft survives on the campus. By 1916, enrollment had grown to 39 students, including its first two female students, Ruth Brown and Grace Odell. On October 29, 1916, a devastating fire destroyed the main building of the school, prompting its relocation. In 1917, the new school facility was constructed on its present site above Mundy Heights, with the land donated by several El Paso residents. In a period when United States architects were designing in styles adopted especially from Europe, Kathleen Worrell, wife of the university's dean, was attracted by photographs of the Kingdom of Bhutan in a 1914 issue of National Geographic magazine, which showed the dzong architecture style of its Buddhist monasteries. The resemblances between the local terrain and mountainous features of Bhutan inspired her to propose designing early buildings of the mining school in the dzong style. Liking its distinctiveness, administrations have continued to choose that style for additional facilities, including the Sun Bowl football stadium and parking garages. Dzong architecture has characteristics such as sloping sides, markedly overhanging roofs, and bands of colored decoration. The University of Texas Board of Regents changed the name of the institution in 1919 first to the Department of Mines and Metallurgy and then to the College of Mines and Metallurgy of the University of Texas (TCM) in 1920. The school's name was changed again in 1949 to Texas Western College of The University of Texas (TWC). Notable events at UTEP include the training in 1961 of the nation's first Peace Corps class, the construction of Sun Bowl Stadium in 1963, and the winning of the NCAA Men's Basketball Championship in 1966. When the 60th Texas State Legislature designated the University of Texas as The University of Texas System in 1967, the name of the school was changed to The University of Texas at El Paso. While the 1967 law designated "U.T. El Paso" as the school's official abbreviated name, the school is more commonly referred to by its trademarked name of "UTEP". Known as the Miners since the school's opening in 1914, TCM's students painted a large "M" for Miners on the Franklin Mountains in 1923; this was later moved to a site adjacent to the Sun Bowl Stadium in the 1960s where it remains today. The school has had achievements in academic and sports areas. In 1969, UTEP won the first of seven NCAA Men's Cross Country Championships. In 1974, UTEP's first doctoral degree program in Geological Sciences was approved. Also in 1974, UTEP won the first of seven NCAA Men's Indoor Track and Field Championships. In 1975 UTEP won both the NCAA Men's Outdoor and Indoor National Championships. UTEP is only one of a handful of universities to win at least 21 NCAA national championships in multiple sports. The campus expanded in 1976 with the completion of the Engineering-Science Complex. That same year, the College of Nursing was founded. In 1977, the Special Events Center (now the Don Haskins Center) was built, featuring a 12,000-seat capacity for sporting events, live concerts, and other performances. An expansion of Sun Bowl Stadium followed in 1982, increasing its capacity to 52,000. The six-story University Library opened its doors to the public for the first time in 1984. In 1988, Diana Natalicio became UTEP's first woman president and is today the longest-serving still sitting president of a major public research university. The next year, UTEP's second doctoral program was approved (in electrical engineering). Doctoral programs in computer engineering, psychology, and environmental science and engineering followed in 1991, 1993, and 1995, respectively. The university's cooperative pharmacy and nursing doctorate programs began in 1996 and 2000, respectively. A biological sciences doctorate program was started in 1997 and a history doctorate followed in 1999. Doctoral programs in international business, civil engineering, and rhetoric and composition were started in 2003. UTEP coach Don Haskins, who compiled a 719–353 record, suffering only five losing seasons, was inducted into the Basketball Hall of Fame in 1997 and the special events center was renamed the Don Haskins Center. He retired from coaching in 1999, and died in 2008. The entire 1966 UTEP team was inducted into the Hall of Fame in 2007. In 1999, UTEP launched its MBA online degree program. It was designated as a Comprehensive Doctoral/Research-Intensive University by the Carnegie Foundation the following year. In 2002, the $11 million Larry K. Durham Sports Center opened and the Sam Donaldson Center for Communication Studies was established. The Academic Services and Biosciences buildings as well as the Engineering-Science complex in 2003. UTEP celebrated its 90th anniversary the next year with the Miners football team going to the Houston Bowl, and the men's basketball team made its 15th NCAA Tournament appearance. In 2005, UTEP moved to Conference USA from the Western Athletic Conference and was classified "RU/H" by the Carnegie Foundation. Mike Price was hired as football coach in 2003 and announced his retirement in November 2012. On December 10, 2012, it was announced that Sean Kugler would be taking over as the new UTEP football coach. Since 2010, Tim Floyd has been the head basketball coach. He was a protege of Don Haskins and is a former coach at the University of New Orleans, the NBA's Chicago Bulls and New Orleans Hornets, and the University of Southern California. The University of Texas at El Paso is subdivided into eight colleges and schools, each of which offers a variety of degree programs including undergraduate, graduate, and post-graduate. UTEP offers 74 undergraduate degrees, 76 master's-level degrees, and 22 doctoral degrees. The university ranked, in 2006, second in federal research spending among UT System academic institutions, and in the fiscal year of 2006, the school reported $45.7 million in total research spending. In 2018, the school announced that total annual research expenditures had reached $95 million. Leading research is being conducted on campus. On January 9th, 2019, it was announced that UTEP is now classified as an "R1: Research University (Highest research activity)" in the Carnegie Classification of Institutions of Higher Education. This designation is reserved for doctoral universities with the highest levels of research activity. In November 2012, it was announced Igor C. Almeida, Ph.D., professor of biological sciences at UTEP, had developed a fully protective vaccine against Chagas disease. UTEP also holds the rights to a patent (# 5,798,392) for the use of methanesulfonyl fluoride (MSF) as a central nervous system selective cholinesterase inhibitor for the treatment of Alzheimer's disease developed by Donald E. Moss Ph.D., in the department of psychology. A Phase I human clinical trial of MSF as a potential treatment for Alzheimer's disease was recently successfully completed in Germany. Hispanic Business magazine has twice ranked UTEP as the number one graduate engineering school for Hispanics. The National Action Council for Minorities in Engineering has called UTEP "a model for other engineering institutions who say that today's minority young people from low-income families can't succeed in a rigorous math- or science-based discipline." The National Science Foundation has designated UTEP as a Model Institution for Excellence, one of only six in the country. UTEP is one of only 11 universities nationwide to receive a $5 million Teachers for a New Era (TNE) research grant from the Carnegie Corporation. UTEP follows a semester system with a spring, summer, and fall semester annually, along with a shorter wintermester in the month of January. In 1916, only two years after the school opened, the original campus buildings were destroyed in a fire. The school was rebuilt on its present site in 1917. Kathleen Worrell, wife of the school's first dean Steve H. Worrell, had seen pictures of Bhutanese buildings in an April 1914 issue of National Geographic. Noting the similarity of mountainous Bhutan (which is in the Himalayas) to the location of the campus, she suggested the new buildings be in the style of Bhutanese dzongs (monastic fortresses), with massive sloping walls and overhanging roofs. This idea was enthusiastically accepted by all. Prominent El Paso architect Henry Trost designed the first four buildings. All buildings since then have followed this style, including a fifth by Trost in 1920, and three more by his firm in 1933–1937. While the early structures only copied the general appearance of a dzong, recent buildings incorporate internal elements of the dzong form as well. The kingdom of Bhutan has honored UTEP's adoption of their country's style. Prince Jigyel Ugyen Wangchuk has visited the campus, and in 2009 the Kingdom presented UTEP with a hand-carved wooden temple to be erected on the campus. The "Himalayan" style of UTEP's campus made it an appropriate site for the Chenrezig Himalayan Cultural Center of El Paso, a Tibetan Buddhist facility. Since the school was established as a department of the main branch of the University of Texas at Austin, the school's colors were originally orange and white. However, in the early 1980s, Columbia blue was added so now the official colors are orange, white, and blue. When the new UTEP athletic department logo was introduced in the fall of 1999, a darker hue of blue was incorporated into the logo, as well as a silver accent to go with the customary orange. UTEP was the first college in the American South to integrate its intercollegiate sports programs. This breakthrough was made in the 1950s. When Don Haskins became basketball coach in 1961, he aggressively recruited black players. In 1966, Haskins' Miners won the NCAA basketball championship, defeating an all-white Kentucky team in the final game. In 1966, at a time when many claimed black players lacked the mental and emotional "necessities" to compete at a high level, the UTEP Miners coach Don Haskins put his usual starting players in the Championship game. They were the first all-black team to start in a game at that level – and to win. This success story was retold in Haskins' autobiography Glory Road (2005) and in the 2006 film Glory Road. UTEP's sports programs have won a total of 21 NCAA Division I national championships. UTEP is tied for 10th overall among schools in Men's Sports Division I championships. Sun Bowl Stadium, seating capacity 51,500, opened its doors in 1963 and is the home to the UTEP football team and to the annual Sun Bowl game. Don Haskins Center, seating capacity 12,000, was built in 1976 and is primarily used by the men's and women's basketball teams. It is also known as "The Bear's Den" as well as "The Don." The arena is also used for concerts by mainstream artists. University Field (UTEP), seating capacity 500, was built in 1991 and hosts the women's soccer team. Kidd Field, seating capacity 15,000, home of UTEP Track and Field teams. This hand symbol represents the traditional tool used by Miners, the pickaxe, and is similar to the shaka sign and the letter Y in american sign language. This gesture is made by UTEP Miners fans when UTEP players are shooting free throws at basketball games, or any time UTEP kicks off at a football game. It was first introduced by the UTEP cheerleading squad during the 1976–77 football season. The first reference to the nickname "Miners" is found in the February 1919 (volume 1, number 1) issue of the Prospector, the school's student newspaper. However, an earlier reference can be found in the handwritten bill (Senate Bill 183) that established the school in 1913, where the author, State Senator Claude Hudspeth, mistakenly wrote "Miners" instead of "Mines," and thus referred to the school as the "State School of Miners and Metallurgy." It is presumed the nickname "Miners" came from the fact the school was founded as the "State School of Mines and Metallurgy." In doing research on this project, early mention of "Ore Diggers" and "Muckers" for the nickname was found, but nothing to determine if the name "Miners" was voted upon by the student body, or if a faculty member, John W. (Cap) Kidd, chose the name. Kidd was a big booster of athletics, especially football, and in 1915, when funds were lean at the school, Kidd donated $800 to equip the football team, though there is no evidence other than anecdotal he contributed this amount. He also assisted with coaching, although he was not the head coach. The present track facility on campus, Kidd Field, bears Cap Kidd's name. "The Eyes of Texas" was adopted by the 1920 student body after the song had been "declared the school anthem for the University of Texas at Austin". UTEP's fight song, "Miners Fight" was also borrowed from the Austin campus. With the estate of Marty Robbins, the UTEP Music Department in the late 1980s wrote new words to the melody of his Grammy Award-winning Country & Western hit "El Paso". This gave UTEP a fight song all its own, to a tune recognized across the nation. Aerial view of the entire UTEP campus, situated between the US–Mexico border at lower left and the west side and Franklin Mountains of El Paso at the upper right. The Organ Mountains near Las Cruces, New Mexico, are visible in the distance. Derrick Caracter (born 1988), power forward/center who played for the Los Angeles Lakers, now with A.S. Ramat HaSharon of the Israeli Liga Leumit. ^ "The University of Texas System Smartbook" (PDF). University of Texas System. Retrieved April 2, 2018. ^ "First-Time Students Push UTEP to New Fall Enrollment Record". University of Texas at El Paso. 2013-06-20. Archived from the original on 2013-09-23. Retrieved 2014-02-14. ^ a b c "UTEP-Fall-Enrollment-Increases-for-20th-Consecutive-Year". University of Texas at El Paso. Retrieved September 18, 2018. ^ The University of Texas at El Paso / Graphic Identity Guide (PDF). Archived from the original (PDF) on 2014-06-30. Retrieved 2017-05-21. ^ "UTEP tops national rankings for producing Hispanic engineers". The University of Texas System. April 3, 2013. Retrieved July 26, 2013. ^ a b "UTEP Attains National Research Top Tier Ranking". The University of Texas at El Paso. Retrieved January 9, 2019. ^ "Official Names; UTEP Encyclopedia". Archived from the original on 2014-03-12. Retrieved 2015-04-19. ^ Napoli, Lisa. "El Paso: Bhutan's Kingly Style Reflected in UTEP Architecture". Los Angeles Times. Retrieved 5 December 2012. ^ University History". UTEP Handbook of Operations, University of Texas, El Paso. Archived from the original on 23 July 2011. Retrieved 1 September 2011. ^ a b "Official Names". UTEP Encyclopedia. December 1, 2014. Archived from the original on 2015-03-16. Retrieved 2015-01-31. ^ "UTEP's Mike Price retiring after coaching for 31 years – ESPN". Espn.go.com. 2012-11-19. Retrieved 2012-12-06. ^ "UTEP hires Sean Kugler as coach". ESPN. Retrieved 10 December 2012. ^ a b "About UTEP". University of Texas at El Paso. Retrieved 13 December 2018. ^ Moss, DE; Fariello, RG; Sahlmann, J; Sumaya, I; Pericle, F; Braglia, E. "A randomized phase I study of methanesulfonyl fluoride, an irreversible cholinesterase inhibitor, for the treatment of Alzheimer's disease". Br J Clin Pharmacol. 75: 1231–1239. doi:10.1111/bcp.12018. PMC 3635594. PMID 23116458. ^ "Carnegie Corporation Names New Teachers Program Grantees". Philanthropy News Digest. Retrieved 20 December 2012. ^ "Academic Calendar". University of Texas at El Paso. Retrieved 13 December 2012. ^ Soltero, Ed (January–February 2009). "UTEP's Bhutanese Campus Goes Modern". Texas Architect. 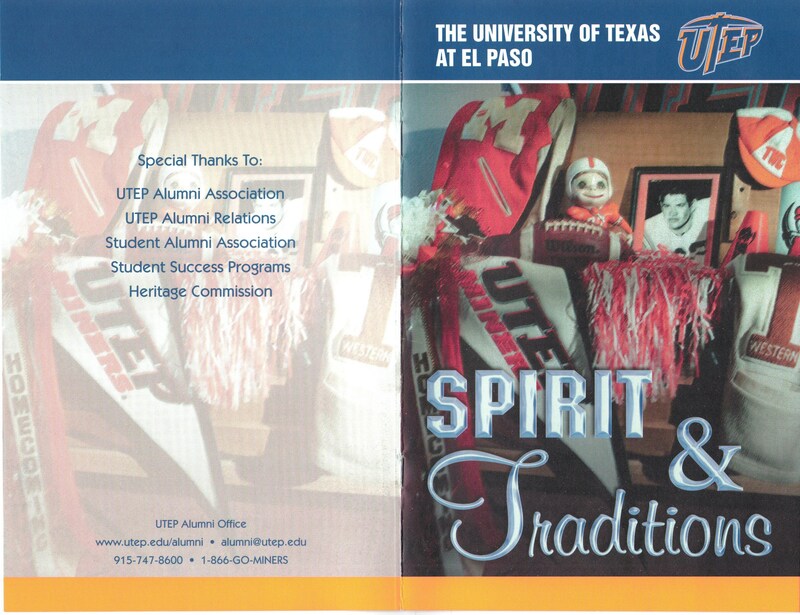 ^ "Spirit and Traditions – University of Texas at El Paso". utexas.edu. Archived from the original on 2012-02-21. Retrieved 2014-01-05. ^ "Songs – University of Texas at El Paso". utexas.edu. Archived from the original on 2008-09-07. Retrieved 2014-01-05. 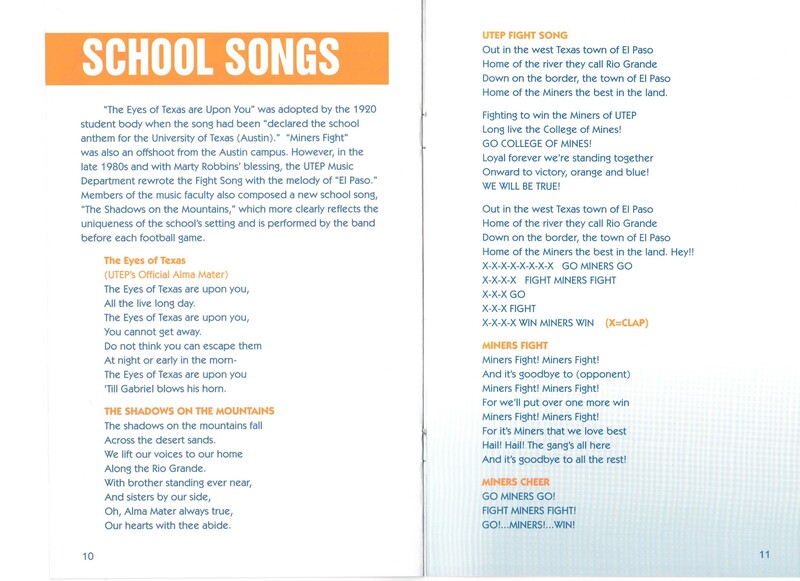 ^ "School Songs – University of Texas at El Paso". Archived from the original on 2014-02-22. Retrieved 2014-01-05. The Centennial Museum and Chihuahuan Desert Gardens is a cultural history and natural history museum on the campus of the University of Texas at El Paso in El Paso, Texas, United States. The museum was built during the 1936 Texas Centennial. César Blanco is a Democratic member of the Texas House of Representatives and a veteran of the United States Navy. He has represented District 76 since 2015. Diana Natalicio (born August 25, 1939) is an American academic administrator who serves as president of the University of Texas at El Paso (UTEP). After growing up in St. Louis, Natalicio studied Spanish as an undergraduate, completed a master's degree in Portuguese and earned a doctorate in linguistics. She became an assistant professor at UTEP in 1971, and was named the first female president of the university on February 11, 1988. As of February 2016, no incumbent president had been in service longer at a major public research university. In 2016 Natalicio was named to Time Magazine's list of 100 most influential people. Edna Gundersen is an American journalist who was a longtime music writer and critic for USA Today. Gundersen grew up in El Paso, Texas. She attained a degree in journalism from the University of Texas at El Paso and then wrote features and entertainment news for the El Paso Times from 1977 to 1987. Being part of the Gannett Company news chain, her articles began appearing in USA Today in 1986, and then that paper hired her directly from 1996 to 2014. Her pieces and reviews have been frequently quoted in the rock and pop press, and the broad, national reach of USA Today has made her an influential writer. Elisa Jimenez (born 1963) is an interdisciplinary artist, primarily in fashion design but also including writing, drawing, painting, performance art, and art installation. Her main ongoing project is called "The Hunger World," a world of marionettes ranging from 2 inches to 30 feet in height. Evelina "Lina" Ortega is an American politician. She is a Democratic member of the Texas House of Representatives, representing the 77th District. She won the November 2016 general election and was sworn into office on January 10, 2017. KTEP (88.5 FM) is a non-commercial radio station broadcasting a National Public Radio format from the Communication Department at the University of Texas at El Paso in the United States. The station plays a mixture of NPR, Public Radio International, American Public Media, and locally originated programming. Jazz forms an extensive part of the music programming, as well as classical music, folk music, blues and new-age music, alongside news and public affairs programs. The station began in October 1946 as WTCM, a carrier current station based at what was then Texas College of Mines. In 1947, it changed its calls to KVOF after finding out the WTCM call letters were already being used by a station in Traverse City, Michigan. In 1950, it applied for and won a full license. The station began broadcasting educational programming aimed at elementary school students as well. Originally broadcasting at 10 watts, in 1966 it moved to space on KROD-TV (now KDBC-TV)'s tower, boosting its coverage area to every zip code in El Paso. In 1967, the station moved to its current call letters of KTEP along with the university name change to The University of Texas at El Paso. In 1971, the station became a charter member of National Public Radio and increased its broadcast day to 18 hours and to 24 hours in 1997. In 1980, it moved its tower to its current location on KVIA-TV's tower. Memorial Gym is a 5,200 seat multi-purpose arena in El Paso, Texas. It opened in December of 1961, replacing Holliday Hall, and was home to the Texas Western College Miners basketball teams, until the Don Haskins Center, then known as the Special Events Center, opened in 1977, by which time Texas Western had changed its name to the current University of Texas at El Paso. Memorial Gym was the home court of the 1966 Texas Western basketball team that won the NCAA title, using five black starters to defeat Adolph Rupp's all-white Kentucky squad. Since 1974 Memorial Gym has been home to UTEP women's volleyball. Memorial Gym hosted the first and second rounds of the 2011 Conference USA Women's basketball tournament. Philip Ray Martinez (born 1957) is a United States District Judge of the United States District Court for the Western District of Texas. Veronica Escobar (born September 15, 1969) is an American politician serving as the U.S. Representative for Texas's 16th congressional district, based in El Paso. A member of the Democratic Party, Escobar previously served as a County Commissioner and County Judge for El Paso County from 2010 to 2017. Wilson Homer "Bull" Elkins (July 9, 1908 – March 17, 1994) was an American educator and university administrator.